On top of being the kind, charismatic star and namesake of the heartwarming and hilarious Joe Pera Talks With You on Adult Swim, comedian Joe Pera is also a lifelong fan of the Bills. The Buffalo native grew up watching the Jim Kelly- and Thurman Thomas-led Bills win four consecutive AFC titles…and lose four straight Super Bowls. Even after an endless string of ineffective quarterbacks and a playoff drought that extended 17 years, Pera’s affinity for his hometown team hasn’t wavered. Over the summer, while interviewing him prior to his Blueberry Tour stop in Milwaukee, we also asked Pera a few questions about growing up as a Bills fan, some past players he loves, his outlook for this season, and why he decided to make his character in Joe Pera Talks With You a Packers fan. Before Pera’s favorite AFC and NFC teams meet this weekend, read what he had to say. MR: One thing I noticed on the first episode of the show is that Joe, the character, is apparently a Packers fan. There’s a Packers pennant in his home. I’ve heard [Michigan’s Upper Peninsula, where the show is set] has adopted the Packers as their team for the most part. Was your character made a Packers fan for the sake of accuracy, or was there another reason behind it? 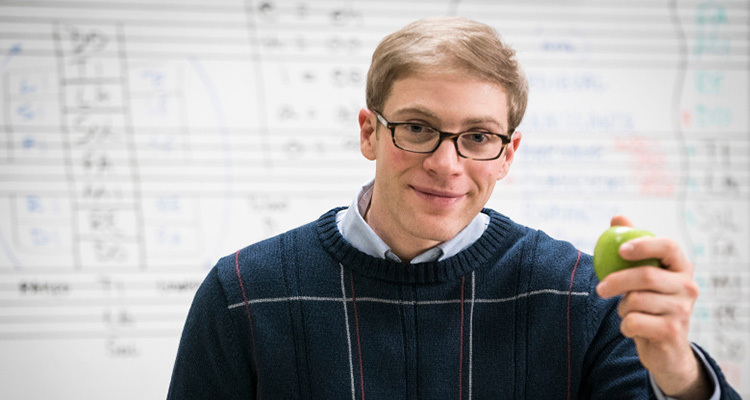 Joe Pera: There was actually a discussion about it because the U.P. is fairly split between the Lions and the Packers. But I’ve always liked the Packers. They’re kind of similar to the Bills in that they’re a small team and people go party in the parking lot. It’s not like a big city stadium. I’ve always liked the Packers for that reason, and that’s why I leaned towards them [for the character] because they’re like the NFC Bills—except they win. MR: Yeah! That’s exactly the way I feel about the Bills. That’s my AFC team because it’s the Bizarro World version of what we have here. And the Packers were really bad in the late ’80s and the early ’90s when the Bills were great. It’s like the fortunes have been reversed since Brett Favre. JP: Yep. It’s all about the quarterback. MR: So how long have you been a Bills fan? JP: I grew up watching them. I mean, I was very small when they were in the Super Bowl those four years. I kind of didn’t realize until later how disappointing it was. I guess I got sensitive for my dad, who used to go to all the games he could when they were winning. I was pretty young, so I didn’t quite see the significance of it other than just noticing that my relatives were very bummed out for a couple years. Now, there’s a Bills bar in New York [City] I’ll go to, and I like going to games a lot. MR: Who were some of your favorite players growing up? I know there were a million quarterbacks after Jim Kelly. One guy I always liked was Don Beebe because he wound up on the Packers. JP: Yes, I liked Don Beebe. I liked Andre Reed a lot. Steve Christie was the kicker for a while, and I forget the name of the punter. I liked him, too. He does West Herr Chevrolet commercials now. He was always a good guy, and a part of the team when we had two really good kickers. There are a lot [of players], but those are some of my favorites. MR: Are you going to make it to the game? JP: I don’t know. I’ve yet to go to a Packers game. A couple people went on a day off [last year], but I didn’t have it in me. I was too tired. MR: So, like you said, it’s been bad lately. But the long Bills playoff drought ended last year. Obviously there was a trade and Tyrod Taylor is gone. LeSean McCoy has some off-the-field things going on. Is there anything to be excited about this year? JP: I mean, I know better by now. I want them to be good, and the whole mood of the city is affected by it. I don’t know…you don’t want to get too far ahead of yourself in your hopes for the season, but it was really nice for them to be in the playoffs again last year. It was 17 or 18 years, I think. It was quite a while, so it was nice. We were in Milwaukee when [Aaron] Rodgers got hurt this past fall, and I remember how the whole city of Milwaukee and everyone in the area seemed really bummed. I wouldn’t wish that on anybody. I wish the best for the Bills and the Packers.